From A to Zinc 16 vitamins/minerals as a daily dietary supplement Helps support the immune system, maintain bone health, dental health and eyesight, and contains antioxi..
DLUX JUNIOR VIT D 400 IU SPRAY Fast and effective with a peppermint flavour, provides a daily dose of vitamin D in a convenient oral spray. Vitamin D 400 IU plays a key role in the maintena..
HealthAid JuniorVit - Chewable (Tutti-fruity Flavour) (Age 2 plus) Blister JuniorVit Tablets are designed to combat today’s modern lifestyle where children are often subjected to fast food diets,..
LUTEIN WITH OMEGA-3 FORMULA WHICH HELPS TO PROTECT THE RETINA IN THE EYE AND MAINTAIN OCULAR FUNCTIONING. Mr. Tumee™ Lutein with Omega-3 is the only gummy vitamin in the world that combines Lute..
MR. TUMEE VITAMIN C Dietary supplement rich with Vitamin C for kids. Mr. Tumee Sugar Free Multi-vitamin is a unique Multi-Vitamin formula, which is Sugar Free. It contains a combin..
MR.TUMEE CAL+VIT.D GUMEE For prevention and treatment of Rickets. Calcium Plus Vitamin D A blend of Calcium and Vitamin D needed to support bone health Mr. Tumee™ Calcium Plus..
A complete multivitamin formula which supports healthy growth and development. Mr. Tumee™ Multi-Vitamin and Mineral formula contains an essential combination of ten vitamins a..
Paradox OmegaSchool - Omega 3 chews for kids and teens Pure & Natural Omega 3 Vitamin D3. Perfect for growing minds and fussy taste buds. Great tas..
Vitamin C with Orange FLAVOR Helps maintain bones, teeth and gums. Suggested Use As a dietary supplement for adults and children ages four and older, take one (1) chewable tablet daily, or.. Description Since 1947 Fun to Eat! Great Taste! Non-GMO Supports Immune Health No Artificial Flavors or Artificial Colors Gluten, Wheat & Dairy Free Suitable for Vegans Dietary Supp..
VITANE DROPS 30 ML Food supplement, vitamins and minerals together to provide nutrients required for normal growth and development. 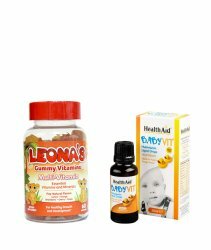 Description: Vitane drops is a careful blend of necess..
VITANE LIQUID 200 ML Dietary Supplement supports childhood growth. ALL ROUND DEVELOPMENT FOR GROWING KIDS Childhood a phase of enormous changes in the metabolic activities resulting in rapid o..